When you enter King's College Chapel in Cambridge, England, the first thing you do is look up at the magnificent vault of the ceiling. For me, looking up at the beautiful fan-like splays of the ribs always made music resound in my head, perhaps a Bach chorale that I had heard performed there or perhaps something from the Festival of Nine Lessons and Carols that is broadcast from the chapel around the world at Christmastime. Then there is the light. On a summer's day, "the windows blaze into life, walls of floating light and colour that sparkle and ripple to the changing rhythm of the clouds and sun, 'flecking the vast interior with glory,' according to one former King's undergraduate, E. M. Forster." 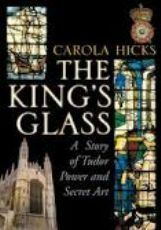 Thus Carola Hicks introduces the windows in The King's Glass: A Story of Tudor Power and Secret Art, newly reprinted by Pimlico. It was her last book published before her death in 2010; she had been, among other jobs in a varied career, the curator of the stained glass museum in nearby Ely Cathedral. Now I'd love to go back to the chapel; I had no idea that the lovely windows had such a tumultuous and fractious history, reflecting the complicated times in which they were planned and installed. Even if I never get back, though, I am, thanks to Hicks's book, seeing the windows with new clarity.